Industry hmm? The reality is we talk a lot about it! The processing and shaping of iron in the fire has been passed down from craftsman generation to artisan generation for centuries. In order to produce decorative objects, physical strength, artistic talent and contemporary production techniques are required. Wrought iron products offered to you today combine design, sophisticated looks, durability and functionality. 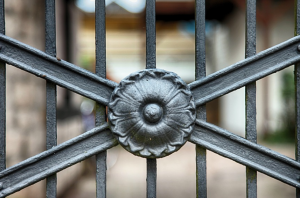 For centuries, items made of forged iron have been used for decorative design in exterior and interior areas. Although precious metal items and similar modern materials are increasingly entering the market, forged iron has a very special appeal and is as popular today as it was then. The use of the material wrought iron is attractive, for example, to realize individual design ideas from the house number, outdoor light to Gartenzaum. Wrought iron can be used to produce almost all objects used in architecture. For example, you can decorate a variety of elements on the balcony, the windows and / or in the outdoor area with forged iron elements. Not only because of the exceptionally high representative appearance, the investment in this material is worthwhile for you. A solid processed and properly maintained product made of forged iron is almost indestructible. Forged iron items should always be treated with protective paint. If you buy a fence or a garden gate made of untreated material, you should apply protective varnish to the product after setting up. A special coating protects the forged metal from rust, so you only have to re-paint it every few years. Furthermore, you will receive valuable tips from the manufacturers against the formation of moss or moss and how to protect your forged iron product from scratches. A railing made of forged metal is a particularly decorative fall protection for your balcony. Despite the look in the Baroque style, such a railing is just as popular today as it was then. In general, wrought iron is a material for eternity. To remove dust and dirt particles, wipe the wrought iron with circular motions. If necessary, moisten the cleaning cloth or sponge again each time. A detergent can be made from 950 ml of water and 1 tbsp soap. Wrought iron is an easy-care material. To keep your railing or bridle long, you must remove rust and moss regularly. Moss can be removed quickly and easily with a steam cleaner. If rust has formed in some places, remove them with sand paper or with a wire brush and then apply a new coat of protective varnish. You should repeat the treatment with protective varnish in a regular cycle. Copyright 2019 AW-TECHNICS. All rights reserved. Powered by WordPress. Theme: Suffice by ThemeGrill.